Refer to the exhibit. In what situation would a technician use this tab? When the device will not be using the Internet. When a device is behind a firewall and software is being used that needs access to a remote network. When the computer will be using a VPN connection and accessing the Internet while connected through the VPN. When a laptop is used both at work with DHCP and at home with a static IP address. A technician is attempting to repair a Windows 7 laptop that has a missing or corrupt OS file that prevents Windows 7 from starting up. The technician reboots the laptop and accesses the WinRE via the F8 key. Which option must the technician choose in the System Recovery menu to locate and fix the missing or corrupt system files? After complaints from users, a technician identifies that the college web server is running very slowly. A check of the server reveals that there are an unusually large number of TCP requests coming from multiple locations on the Internet. What is the source of the problem? The server is infected with a virus. There is insufficient bandwidth to connect to the server. There is a replay attack in progress. A DDoS attack is in progress. A user reports that a laser printer is printing shadow images and letters. Which part should the technician replace to correct this problem? A user has determined that the computer hard drive is failing. Before the failure, the user implemented a backup scheme running a normal backup every end of the month and then incremental backups every other day. What is the correct sequence that the user has to follow in order to restore the backup? Restore the last incremental backups in inverse order, and then restore the last normal backup. Restore the last normal backup first, then restore the incremental backups in order. Restore the last incremental backup and then restore the last normal backup. Restore the last normal backup first, then restore the last incremental backup. Not enough RAM is installed in the system. The hard drive is full. A technician connects a new LCD monitor for the first time and finds the display very pixilated. What is a possible solution to this problem? Set the screen to native resolution. Which statement that is related to running 64-bit software is correct? 64-bit software requires a 64-bit processor but can run on a 32-bit operating system. 64-bit software can run on a 32-bit processor but requires a 64-bit operating system. 64-bit software requires a 64-bit processor and a 64-bit operating system. 64-bit software can run on a 32-bit processor using a 32-bit operating system but the software performance will be slower. Which user account should be used only to perform system management and not as the account for regular use? A technician is troubleshooting a network connectivity problem. Pings to the local wireless router are successful but pings to a server on the Internet are unsuccessful. Which CLI command could assist the technician to find the location of the networking problem? Android has been implemented on devices such as cameras, smart TVs, and e-book readers. Each implementation of Android requires a royalty to be paid to Google. All available Android applications have been tested and approved by Google to run on the open source operating system. Android applications can only be downloaded from Google Play. Android is open source and allows anyone to contribute to its development and evolution. Use only upper case and numeric values in passwords. Include letters, numbers, and symbols. Change the password once each year. Passwords should contain symbols only. A technician is about to install and configure a wireless network at a small branch office. What is the first security measure the technician should apply immediately upon powering up the wireless router? Disable the wireless network SSID broadcast. Configure encryption on the wireless router and the connected wireless devices. Enable MAC address filtering on the wireless router. Change the default user-name and password of the wireless router. A technician is troubleshooting a Windows 7 laptop that takes significantly longer than expected when performing a file search. What is the possible cause? The file permissions are not set. The disk type is dynamic. The disk type is basic. A user is viewing the Disk Management utility on a PC that is running Windows XP and notices that one of the disks is marked as Foreign. What does this mean? This is a dynamic disk whose partition has been deleted. This is a dynamic disk from another PC running Windows XP. This is a basic disk that has just been converted to a dynamic disk. This is a disk that does not contain a valid signature. What action should a technician take before upgrading computers from Vista to Windows 7? Run Windows 7 Upgrade Advisor. Which type of malware is disguised as a legitimate program? A technician has successfully removed malware from a PC and finds that when the system is rebooted error messages are displayed about missing and corrupt system files. What utility can the technician use to replace or fix any corrupted system files? An “OS not found” error message is displayed when a computer is started. The technician determines that the single hard drive is configured as a slave. What needs to be done to correctly configure the hard drive as a master? Change the master/slave setting in System Tools. Change the master/slave setting in BIOS. Change the jumper settings on the hard drive. A technician is troubleshooting a server and wants to see all open shared files on it. What command could the technician use to do this? A technician is troubleshooting a problem where many websites return a “certificate not valid” error. The technician notices that the date and time are not current and resets these to the correct settings. The previously inaccessible websites are now accessible. However, when the computer is restarted the same problem reoccurs. What can the technician do to prevent the date and time from resetting? A technician wants to use Remote Desktop to configure another PC. Which firewall port on the remote PC should be open in order for Remote Desktop to work? A technician needs to permanently destroy data on some drives before disposing of them. What is the best way to do this? Shatter the drive platters with a hammer. What kind of tool or substance is better to use to remove spilled toner on a laser printer? On a PC that is running Windows 7 Ultimate, a user sets up a home entertainment system and creates a homegroup. The user then joins two other PCs to the workgroup, one PC running Windows 7 Starter and the other running Windows 7 Home Basic. What else must the user do in order to have the user accounts on the Windows 7 Home Basic and Windows 7 Starter PCs access the shares on the home entertainment system? Users have to be added to the user accounts on the home entertainment PC. Users on the PC that is running Windows Home Basic will have to be manually added to the homegroup. Nothing has to be done. All users accounts on all the PCs will automatically be added to the homegroup. User accounts on all three PCs have to be added to the homegroup. Users on the PC that is running Windows Starter cannot join the homegroup. A user wants to extend a primary partition formatted with the NTFS file system with the unallocated space on the hard disk. What must the user do after the primary partition is extended to make it usable? Format the disk with the FAT64 file system. Convert the disk type to dynamic. Ensure that the disk type is basic. Partition the new space as a basic disk. A user has detected that one of the virtual machines in a computer is infected with a virus. Which statement about the situation is likely to be true? The host machine antivirus program requires an update. The host operating system is not necessarily infected with a virus. All of the virtual machines running on the host are infected with a virus. The host machine operating system has a bug. What type of file system allows the use of files larger than 5 GB and is mostly used on internal hard drives? A user purchases a new 802.11n wireless router and sets it up at home. The user notices that 802.11n devices can connect to the wireless router but 802.11g devices cannot connect. What is the problem? The wireless router is set to use the wrong channel. The wireless router has not been set for mixed mode. The wireless router is faulty. The wireless router is using the wrong SSID. What is true about restore points? Restore points should always be created before making changes to a system. Once System Restore is used to restore a system, the change is irreversible. Restore points back up personal data files. Restore points recover corrupted or deleted data files. A technician has created a customized image of Windows 7 and wants to deploy it to 30 PCs. Which utility can the technician use to do this? A user reports that a computer is unable to print on an inkjet printer. The technician has determined that there is no paper in the paper bin. What is the next step in the troubleshooting process? A user wants to map a network drive on a PC that is named “WORK2″ and runs Windows 7. The name of the shared resource the user wishes to map to is called “installs” and is located on a workstation called “WORK1″. What would be the correct path for mapping the network drive? What is a possible situation when it might be necessary to boot Windows 7 from a USB device, a CD, or a DVD? What is required in order to connect a Wi-Fi enabled laptop to a WPA secured wireless network? Which security threat hides the resources that it uses from antivirus programs? A technician is troubleshooting a workstation in a domain that has been infected with a virus. What is the first step the technician should take to clean the infected workstation? Disconnect the workstation from the network. Which feature of a mobile device uses sensors to detect the orientation of the screen and changes the display to landscape or portrait as required? A Windows XP PC that was formatted with the NTFS file system displays a missing or corrupt DLL error message when a certain program is run. What is the cause of this? The OS must be 64 bit in order to support the DLL. The NTFS file system does not support DLLs. The DLL file was not installed with the program. The DLL file was not registered during installation of the program. A user has a computer that is infected with spyware. What should be performed before removing the spyware? This is a flash item. Please click below to answer this item. Assign static IP addresses to the authorized devices. A technician successfully removes malware from an infected PC. When the PC is rebooted it displays error messages about missing system files. How can the technician fix this problem? Disable unknown services using Msconfig. Write a new boot record with Fixboot. A user has shared a directory on the network. The files in the directory can be modified, created, and deleted when accessed from the local computer, but when accessed from another computer, the files can only be viewed. What can the user do to gain all the permissions when the files are accessed over the network? Update to the NTFS file system. A technician is trying to troubleshoot a Windows 7 PC remotely and finds that pings to the target machine fail and that telnetting into it fails as well. What changes should the technician make on the Windows 7 firewall in order to telnet into the target PC remotely? Open ports 20 and 21 on the target machine. Open port 23 on the target machine. Open port 80 on the target machine. Allow ICMP messages on the target machine. Which statement is correct about installing a 32-bit operating system on a x64 architecture? The OS will run correctly. This combination will provide better security. The OS will always make use of all the RAM available. The OS can address more than 128 GB of memory. What tool can be used to find and attempt to fix file structural errors on a hard disk in Windows 7? What type of partition has the ability to create volumes spanning across more than one disk? A user needs to frequently access data from a shared folder on a remote computer. Which command would be used to map a network drive to the remote share? A user reports that a PC is losing files, not opening some files, and is performing slowly. The technician suspects problems with the hard drive. What should be done to protect the data that is on the PC and to determine the source of the problem, without risking total drive failure? Run CHKDSK, then back up all important files. Run CHKDSK, then run FDISK. Run FDISK, then replace the hard drive. Back up all important files, then replace the hard drive. Back up all important files, then run CHKDSK. Which Windows utility can be used to schedule a regular backup for preventive maintenance? A business organization is configuring security on the mobile devices that are used in the organization. The security policy states that business data on mobile devices should only ever be accessed by employees. Which mobile device security feature can be used to best ensure that business data is rendered completely inaccessible if the device is lost or stolen? A technician troubleshooting a network problem has used CLI commands to determine that a computer has not been allocated a correct IP address from the DHCP server. Which command can the technician use to solve this problem? A computer technician has successfully returned a laptop to full operation and verified system functionality. Actions the technician performed included modifying the registry and applying patches to the operating systems. What is the next step in the troubleshooting process that the technician should do? Consult manufacturer manuals and repair logs. Re-attach and test all peripherals. How can a user prevent specific applications from accessing a Windows computer over a network? 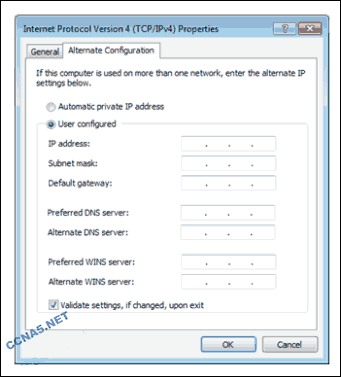 Block specific TCP or UDP ports in Windows Firewall. Use the last known good configuration to boot the computer. Run fdisk/mbr from the command prompt. Run the bootrec/fixmbr command from the System Recovery console. Restore the BOOTMGR file from the Windows installation media. Restore ntdetect.com from the Windows installation media. A computer locks up frequently, and no error message can be seen on screen. The problem occurs every time the user attempts to restart the computer. What is the most likely reason for this problem? A technician has replaced the power supply unit of a PC, but notices that when the PC boots up the RAID array cannot be found. The technician verifies that the wattage of the replaced power supply unit matches the original one and that the RAID controller is receiving adequate power. What is the problem? The RAID controller requires a higher voltage setting. The CMOS settings have not been saved. The power cables were incorrectly reconnected to the array of drives. The power supply unit is not supplying the correct voltage. A user notices that there is intermittent wireless connectivity on a laptop that is running a wireless PCI Express Micro card using the wireless 802.11n standard. What should the user do to fix the problem? Move the laptop to a new location. 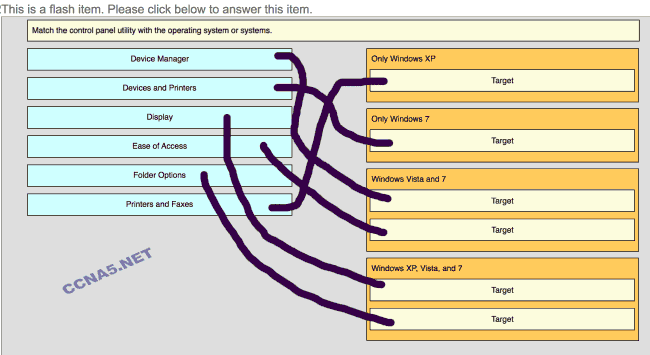 Which type of user account is created automatically during a Windows XP installation? A cleaner attempts to enter a computer lab but is denied entry by the receptionist because there is no scheduled cleaning for that day. What type of attack was just prevented? After consulting the manufacturer manuals, a technician applies a series of recommended solutions that resolve a problem with a workstation computer. What is the next step in the troubleshooting process that the technician should perform? Determine the next steps to resolve the problem. Test the theory of probable cause. Document the findings, actions, and outcomes. Verify the solution and confirm full system functionality. A user is able to only access files required to perform a specific task. What type of security practice is being applied? A user replaced a PC CPU with a faster one, but now the PC displays a BSOD on bootup. What is the problem? The CPU voltage is set too high. A user receives an email requesting verification of the password that is used to access bank files. What type of security threat is this? A company has replaced five desktop computers in the accounting and finance department with new computers. The plan is to donate the recovered computers in a fully functional state to a not-for-profit community organization. How can the company ensure that sensitive financial data cannot be accessed once the computers are donated? Perform a high-level format on the hard drives. Drill holes through the hard drive platters. Data wipe the hard drives by using specialized software. Delete all the files and directories on the hard drives. Which ping command option would be used to resolve the hostname when testing connectivity to a specific IP address? Always require a user name and password to be configured. Keep your password securely under your keyboard. Do not allow any customers into the workplace. Always ask for the ID of unknown persons. A company has a guest wireless network available for visitors while on the company premises. A technician has noted that unauthorized users are connecting to this wireless network from outside the premises. Which action can be taken to reduce unauthorized connections to the guest wireless network while enabling visitors to still connect quickly and easily without assistance while on the company premises? Reduce the radio power level. Which statement is correct about applying firmware updates? Firmware updates should not be included as part of the preventive maintenance program. It is possible to use the Roll Back feature to reverse the change. Firmware updates are sometimes irreversible. The firmware updates can be installed automatically using the Windows Service Pack utility. Register the DLL file using the regsvr32 command.